I don´t get to listen to Danish folk metal every day. 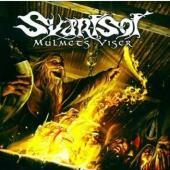 SVARTSOT make themselves noted by melodic metal and growl in Danish. Besides that they have Hans-Jörgen Martinus Hansen on whistles, accordion and mandolin. Danish mythology, folklore and history in a new shine all in all. Already in opener “Athelred” the music is compelling and charming. Who needs KORPIKLAANI after hearing SVARTSOT? Thor Bager´s voice is cruel enough, no more, no less. The tracks are fast enough to get a ceilidh going in the moshpit. SVARTSOT plays heavy melodic metal, and spice it up with the vocals, that are in the death vein. I would appreciate the opportunity to see these Danes live. The action in “Hojen på Gloedende Paele” must be seismic, complete with the “håj” chant and all. But they are not entirely dependent on being folky, even a guitar based track like “Pa Odden av Hans Hedenske Svaerd” is very entertaining. Albeit that kind of track is cozy in an AMON AMARTH-way. For the lionpart of the album it is a mix of NORDMAN, KORPIKLAANI, Denmark and death/metal that prevails. But SVARTSOT is variation, melodic patterns and virtually impossible to listen to sitting straight. Imagine that music this heavy can be this enjoyable.